Adjutant is an open-source, interactive, and R-based application to support mining PubMed for literature reviews. 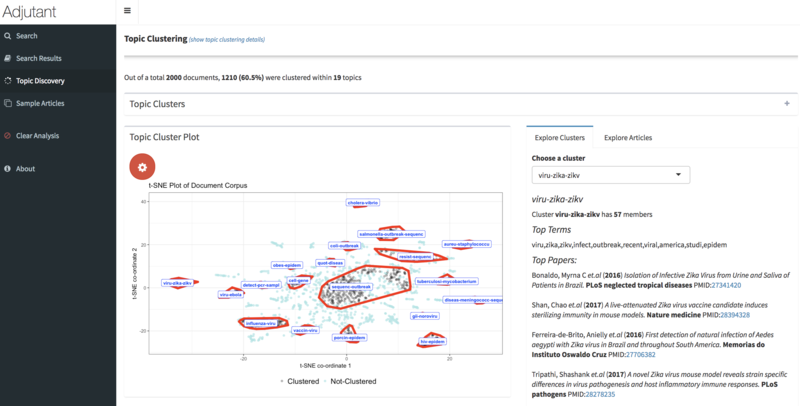 Given a PubMed-compatible search query, Adjutant downloads the relevant articles and allows the user to perform an unsupervised clustering analysis to identify data-driven topic clusters. Following clustering, users can also sample documents using different strategies to obtain a more manageable dataset for further analysis. Adjutant makes explicit trade-offs between speed and accuracy, which are modifiable by the user, such that a complete analysis of several thousand documents can take a few minutes. All analytic datasets generated by Adjutant are saved, allowing users to easily conduct other downstream analyses that Adjutant does not explicitly support. The Adjutant user interface after running the unsupervised topic clustering on 2000 documents from the the query '(outbreak OR epidemic OR pandemic) AND genom*' run on June 6,2018. The GUI consists of four tabs that guide the user through the analysis steps.